Our 1st Annual Recital is a great way for your child to showcase what they have worked on year round at CADENCE DANCE PROJECT. The students will learn their routine for the recital in their normal classes and perform on stage for their family and friends. Please see below for Recital Information, there will be more details coming soon! *Each additional costume for students in more that one class will be $80.00 each. For your convenience, we will AUTOMATICALLY ENROLL EVERYONE on February 6th, 2018 for the Recital. $150.00 will be listed on your account and can be paid via Cash/Check in Office or Visa/MasterCard through your online portal. If you are absolutely unable to participate in the Recital, you must email us by Friday, FEBRUARY 23rd, 2018. All Payments are due by Friday, February 23rd, 2018 to participate in Recital. *We DO NOT automatically charge your accounts. If you would like us to run your card on file, please send us an email and we can run it for you. *All accounts must be at a zero balance to commit to recital. 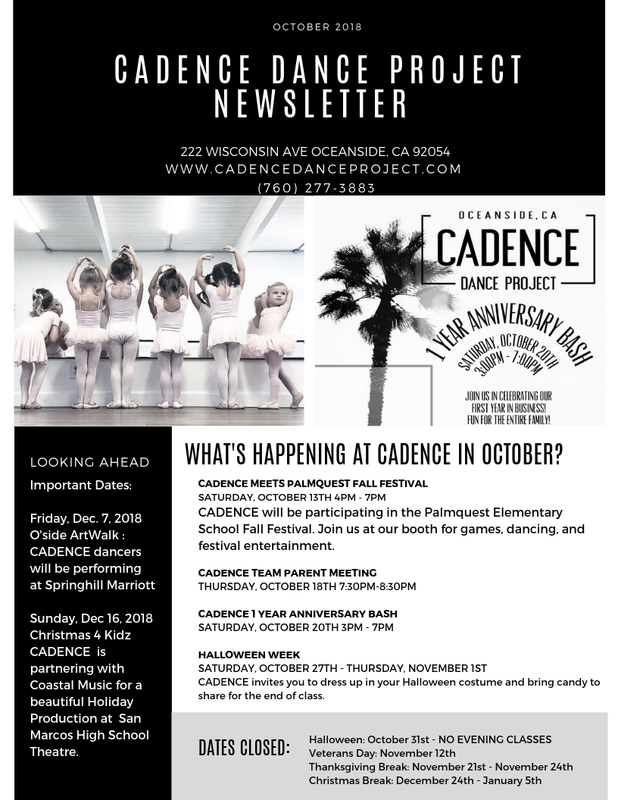 Please let us know via email info@cadencedanceproject.com if you have any questions regarding the 1st Annual Recital and we are happy to answer them. We are looking forward to showcasing the hardwork and dedication of our students during our first year open. Looking forward to sharing this moment with all of you. We are beyond grateful for BB and Hirotton for bringing art and dance together in the community of Oceanside. Be sure to stop by Wisconsin Ave to check out this work of art! We are so excited to announce that CADENCE DANCE PROJECT will be expanding! We will be having a second dance room and front office/lobby by the beginning of 2018! Thank you so much for being a part of the growth of CADENCE DANCE PROJECT and we look forward to working together to continue bringing movement and dance to Wisconsin Ave. in Oceanside.